Is Britain's Dialogue with Hezbollah Misleading? The British government's recent announcement that it will open a dialogue with "the political wing of Hezbollah" is most troubling. In a statement before a parliamentary committee, Bill Rammell, the British foreign office's minister for Middle East affairs, rationalized the decision on the grounds of what his office perceives to be "more positive developments within Lebanon." This British declaration underscores a pervasive failure to properly understand the structure of the Iranian-backed terrorist organization. At worst, the call to distinguish between the group's political and military wings (in terms of decision-making) may be driven by a desire to construct imaginary facts for diplomatic and political purposes. 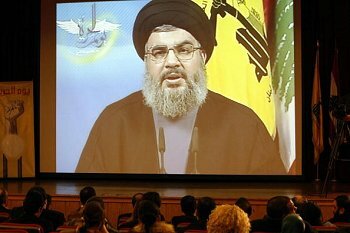 Are officials selling a false image of what Hezbollah is so that they join in the "sitting, talking and listening" with Iran and Syria's regimes now underway? Very possible. But it would have been much better to inform the public that the government intends to talk to a terrorist organization for purpose of national interest, rather than claiming the talks are only with the political wing. Eight years after 9/11 and the subsequent attacks worldwide, citizens are much better informed about jihadist organizations than they were in the 1990's. Officials in the United Kingdom and the United States must realize that claiming there are two Hezbollahs will not fly with most of the public. Hezbollah was founded by the Iranian Islamic Revolutionary Guard (Pasdaran) in 1981. Its military organization, responsible for terror operations, is part of the Consultative Council (al majliss al Istisharee), which is Hezbollah's supreme command, along with the organization's legislators, Fatwa clerics, financial executives and political operatives. This Hezbollah "politburo" oversees the military, security, doctrinal and political actions of the entire apparatus — there is no structural delineation. Furthermore, the Jihad Council — Hezbollah's War Department — which issues the orders for acts of terror, is headed by the secretary general of the organization, Hassan Nasrallah. The council includes many of the organization's "political leaders" — Hashem Safi al Din, Hussein al Khalil, Abbas Ruhani, Ibrahim Aqil, Fuad Shukr, Nabil Kauq and others. Hezbollah is not the I.R.A., which had a clearer delineation between its militia and its military wing, the Sin Fein. Moreover, Lebanon is not Northern Ireland. Yes, British citizens can be easily led to make the comparison by government officials who use the clichés by which most Britons remember the I.R.A., but the attempt to fool the public will be short-lived. The lack of separation between Hezbollah's political and military operations is well documented in public sources. Any suggestion to the contrary is simply ridiculous. If the British government wishes to make that distinction, they will find themselves incapable of answering the most basic questions. Nasrallah, as the secretary general and purported partner in any dialogue, is at the same time the chief political executive of the organization and Hezbollah's supreme military commander. How then will meeting Nasrallah be political, when he is the commander in chief of the militia and its security apparatuses? Will diplomats meet with him between 9:00 and 11:00 AM when he is a secretary general and avoid him at other hours when he wears his military hat? It simply doesn't make sense. If the British government wishes to engage in talks with a terrorist organization, it must make that case and not obfuscate its true intentions of working with Hezbollah's political wing. At the end of the day, Hezbollah will remain who it is, who it says it is and who it will continue to be: a terrorist organization devoted to Jihad against the West. It is more honest to try to convince the public that the time to talk with Hezbollah, Iran and Syria, and even perhaps Hamas, has come. It will be more productive to acknowledge that some liberal democracies aren't able to carry the load of a confrontation with the jihadists than to attempt to rewrite history and reality. Even if the British government chooses to engage with Hezbollah — which is certainly a questionable strategy — they should not do so on the false pretense that there are "two Hezbollahs" just as there were two I.R.A.s. There are not, and the British people are well aware of that fact. Moreover, any negotiations which are premised on such a mischaracterization by the interlocutor cannot possibly succeed for the British. Hezbollah, on the other hand, can and likely will. Dr. Walid Phares, author of "The Confrontation: Winning the War on Future Jihad" is the director of the Future Terrorism Project at the Foundation for the Defense of Democracies.